The 10 symbols forming the Celtic Wisdom Energy System were channeled and created by Steve Malcolm to celebrate the energies of the Summer Solstice, 2003, following a visit to Craft Maraig, a megalithic site comprised of three concentric stone circles near Aberfeldy in Perthshire, Scotland. 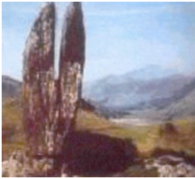 Craft Maraig translates from Gaelic as the “Field of Mary”, that is situated on an energy ley-line alignment with the “Praying Hands of Mary”, a megalithic standing stone 15 miles away in Glenlyon. The symbols stem from Celtic wisdom and are largely Goddess symbols in origin. This beautiful energy system is highly balancing and grounding, and assists us in connecting with our true nature and place in the Universe. It will help release untapped potential, promote balance and tranquility in our lives, and brings all those who are attuned to it the energy of unconditional love. This is an advanced course for those familiar with Reiki and enhances the Goddess energy and unconditional love.